I’ve said before that juxtaposition does not imply eqivalence. It does, however, provide a striking means of raising questions, pointing up similarities where differences are also present and differences where similarities may be more easily discerned — questioning easy assumptions, in other words. 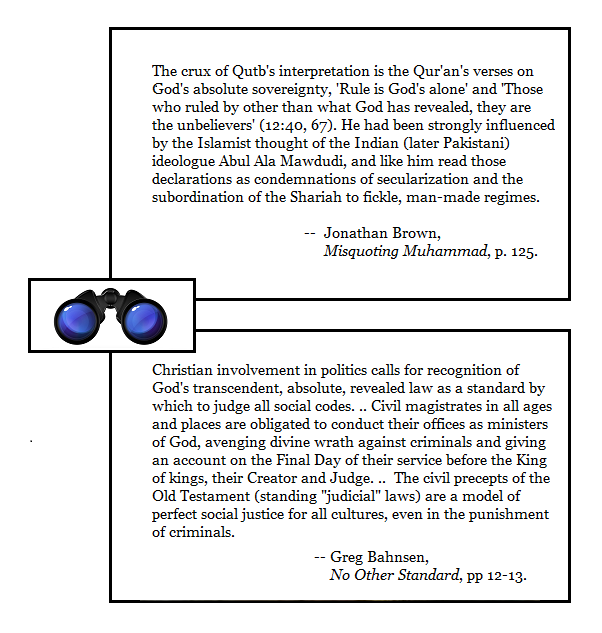 In this juxtaposition, I want to make it clear that a small subsetb of Christians (Dominionists or Theonomists, here exemplified by Greg Bahnsen, lower panel) like a highly visible subset of Muslims (Islamists, represented here by Sayyed Qutb) seek the universal imposition of what they believe to be God’s law. It is worth noting, btw, that Gregory Bahnsen was a postmillennialist, which is to say he expected, to quote Wikipedia, that “increasing gospel success will gradually produce a time in history prior to Christ’s return in which faith, righteousness, peace, and prosperity will prevail in the affairs of men and of nations.” The dominionist / theonomist movement in which he partakes, in other words, is one which is busy making the world ready for Christ, not expecting him at any moment before that work is done. I explained to my host that unless a supernatural man bursts forth from the sky in glory, there is absolutely nothing that the world needs to worry about with regard to Christian end-time beliefs. Christians are called to passively await their defender. They are not attempting to usher in His return. Muslims, on the other hand, are actively pursuing the day when their militaristic leader comes to lead them on into victory. Many believe that they can usher in his coming. Since the objective behind the uprising of Hadrat al-Mahdi is the establishment of divine government throughout the world and the elimination of tyranny and tyrants, it is natural that the Imam will face many difficulties and obstacles in realizing this objective. By conducting military operations, he has to remove those hurdles along the way and overrun one country after another so as to prevail in the east and west of the world and establish the government of divine justice on earth. People will seek refuge in the Hazrat Mahdi (as) as honey bees cluster around their sovereign. He will fill the world that was once full of cruelty with justice. His justice will be as such that HE WILL NOT WAKE A SLEEPING PERSON OR EVEN SHED ONE DROP OF BLOOD. The Earth will return to the age of happiness. Perhaps it is worth noting that Joel Richardson’s quote, above, suggests thatb in his view at least, Christians will not take up the sword until the Second Coming of Christ, and that from Harun Yahya’ statement it is unclear whether there will be bloodshed along the way to the Mahdi’s reign of justice and peace. I’d welcome comments from Joel Richardson, who has commented here on ZP before, Adnan Oktar, and / or Ceylan Ozbudak — especially in clarification of any points I have left obscure or gotten wrong. Thanks.